Oil on cardboard mounted on canvas. In March 1899 Maurice Denis explained in his diary the difference between the two groups into which the Nabis had split. On the one hand, there were Sérusier, Ranson and Denis himself, who used the purest colours, accentuated the symbolic character of their works, attached great importance to the human figure and to draughtsmanship, and in general tended towards a rather "Latin" simplicity. 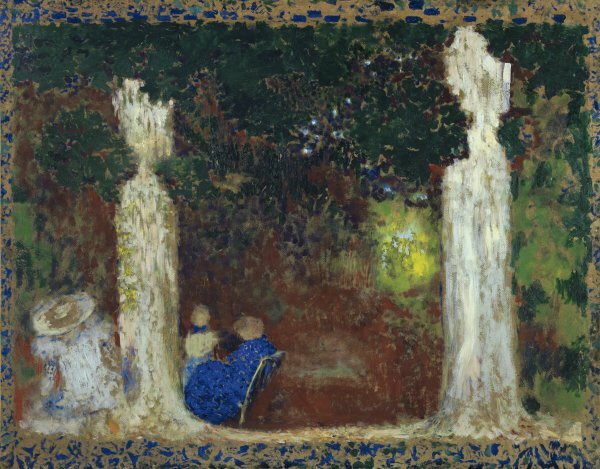 On the other, there were artists like Vuillard and Bonnard who preferred to use darker tones, favoured real images (even though they might be executed from memory), were less concerned with figures and draughtsmanship, and in general produced works that were rather "Semitic" in their complexity. Another way of describing the contrast between the two would be to say that Denis and Sérusier explored abstract spiritual mysteries, whereas Vuillard and Bonnard explored the concrete mysteries of everyday life in the bourgeois interior. Domestic intimacy was dominant even in Vuillard's landscapes. 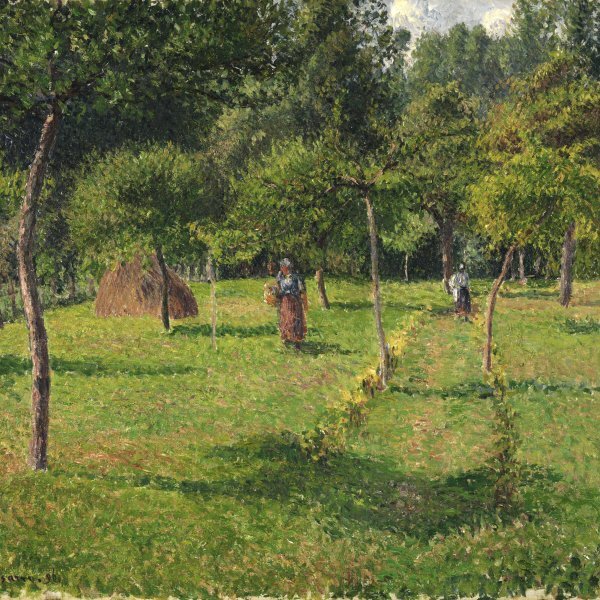 In the 1890s he painted both large panels and smaller-format works showing scenes from the public parks of Paris (the Tuileries, the Luxembourg Gardens, and the Bois de Boulogne) or the private gardens of his friends, such as the country residences of Thadée and Misia Natanson in Valvins and Villeneuve-sur-Yonne, where Vuillard made frequent visits. These enclosed and artificial landscapes are directly opposed to the "fresh air and full sun" favoured by the Impressionists. Although strictly speaking they are exteriors, they are never genuinely open spaces. The atmosphere that Vuillard created was closed, almost suffocating. The human figures become confused with the vegetation, are camouflaged within it just as if they were in one of his interiors surrounded with rugs and wall-hangings. In the oil study shown here, the two white columns, each topped with a vase, constitute ghostly beacons that mark the magical threshold of the garden. A diffuse light radiates from the garden's dark interior. The figures appear as little more than smudges of vibrant colour: the ultramarine of the seated woman, the white of the child looking over the wall. Instead of the flat areas of colour characteristic of Vuillard's early style, this landscape is painted with a dense mass of small brushstrokes and it could be said that during this period he was returning to a type of handling that recalled Impressionism. The use of cardboard as a support is characteristic: Vuillard liked the matt finishes that were produced when the oil was absorbed by the support, while its neutral colour showed through in the unpainted areas, combining with the subtle colour harmonies of the paint. The staccato brushstrokes visible around the edge of the scene form a frame or ornamental border.